The sun is a giant, churning ball of gases, with an atmosphere that flings streamers and blobs of particles into space. 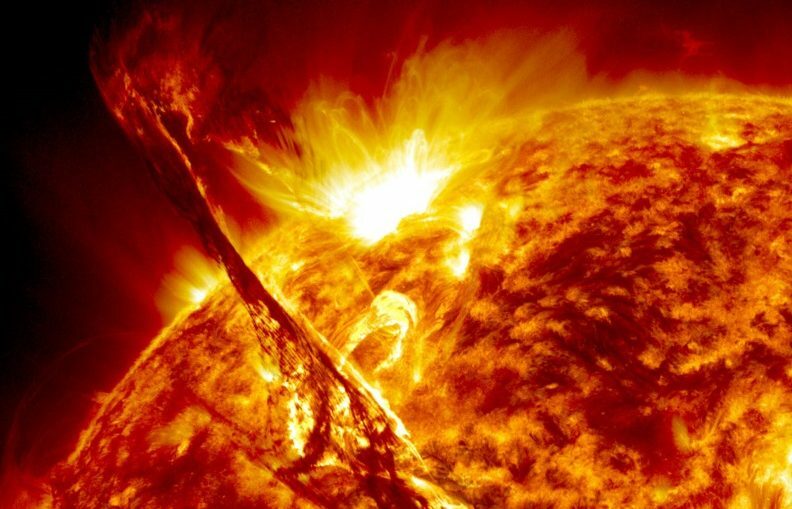 Now, astrophysicists have found that inside the sun’s atmosphere, what may seem like cosmic clutter hides some beautiful order. Particularly, they found and imaged finely detailed streamers, blobs and puffs that pop up in the outer corona, a layer of the sun’s atmosphere that begins about 1,300 miles (2,100 kilometers) from the sun’s surface and extends some 10 million miles (16 million km), according to their study published July 18 in The Astrophysical Journal. Scientists knew a bit about the structure, or lack thereof, found inside the corona. “Anyone who has seen an eclipse knows that the corona is not homogeneous in the way that Earth’s atmosphere is: There are dense regions and rarefied regions all over,” said lead study researcher Craig DeForest, a solar physicist at the Southwest Research Institute’s branch in Boulder, Colorado. And those different densities are driven by the sun’s magnetic field, he added. Beyond that low-resolution understanding, however, they were sort of left in the dark. Until now. “By looking through coronagraphs (ordinary visible-light cameras with special bits of metal in front, to block out direct sunlight), we can see individual structures in the corona,” DeForest wrote in an email to Live Science, referring to the COR2 instrument aboard NASA’s STEREO-A spacecraft, which orbits the sun between Earth and Venus. One of the main reasons DeForest and his colleagues observed the relatively fine details inside the corona had to do with the advanced processing they used to eliminate any noise in the data — such as that from the light of background stars — used to create the images. And what they saw was somewhat mind-blowing. And, DeForest said, those “fibers” could be even smaller, so much so that the instrument couldn’t resolve them. They also found a lot of blobs, and yes, that is a technical word. It was coined in the 1990s by Neil Sheeley, of the Naval Research Laboratory, who saw the relatively small clouds of charged gas and created time-lapse movies of the phenomenon. Beyond showing some pretty cool features of the sun’s corona, the research could shed light on one of many solar mysteries. For instance, deep in space, the solar wind can gust in wildly violent storms. But scientists don’t know what triggers this “turbulence” in the first place. If the sun is generating that turbulence, then the resulting complex structures should be visible from the very start of the solar wind’s journey. But until now, scientists didn’t have a sharp enough view of the corona to know one way or another. The Parker Solar Probe, which will begin a seven-year mission this month, will probe even deeper into this mystery and others, including why the sun’s corona is 300 times hotter than the lower atmosphere, called the photosphere.